I'm a woman in my early 30's, no kids, divorced, and engaged... will possibly remarry in a year or two. I'm a woman who is comfortable in my sexuality, and open about what I like. If you're a regular follower of mine, then you already know that I write for a few adult novelty websites, and I'm fairly open-minded when it comes to adult novelty items. 30's are supposed to be a woman's prime when it comes to the bedroom, but that doesn't mean that you can't add a little extra spice. I recently came across some wonderful products from Intimina by Lelo, that are for woman of all ages. "We at Intimina believe that feminine health requires special attention and care. As the only global company that is developing a complete line of products solely for the benefit of women’s intimate well-being, we aim not only to provide items representing the very highest standards in quality, but also to build a resource where you can find the facts you need to enjoy your femininity to the fullest. Intended exclusively for pharmacies and reputable outlets, each one of our products has been expertly designed to complement your natural balance and bring out the best in you. Drawing on the support of a worldwide group of medical consultants and gynecologists, we ensure the information we provide and the products we offer are perfectly safe and completely suited to your intimate needs." I'm a woman who suffers from anxiety/depression, and I find that the medications that I'm on affect not only my mood, but affect me in the bedroom as well. I find that I usually require a little extra care, and the Intimina Feminine Moisturizer by Lelo is the perfect product. Looking for something to help assist in kegel exercises? They offer those products as well. 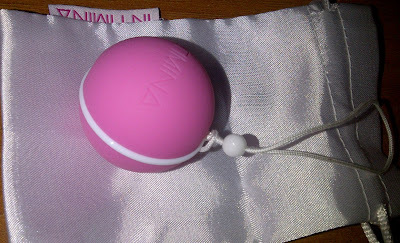 I was also sent the Intimina by Lelo Laselle Kegel Exerciser in 38 grams. Now even though I've never given birth, this product is quite useful for kegel exercises. It helps keep you in top shape down below, and is super comfortable. The Laselle Kegel Exerciser comes in three different sizes: 28g, 38g, and 48g. The company also has a line of massage products, all top of the line and created specifically for a woman, all pharmacy friendly. At every stage of womanhood, having strong and healthy pelvic floor muscles offers a wide variety of benefits that affect everything from pregnancy to menopause, continence and intimacy. However, without an exercise aid it can sometimes be difficult to be sure that you are exercising the correct muscle set and using the correct type of motion. Laselle Kegel Exercisers allow you to enjoy the certainty that your routine will be effective. Women preparing for pregnancy can wear Laselle Kegel Exercisers to prepare the muscles directly involved in labor and delivery, while also reducing the bladder control loss that is typical during pregnancy. Additionally, strengthening your pelvic floor muscles before pregnancy helps set the stage for a faster post-natal recovery from possible tears and episiotomies sustained during childbirth. Those experiencing menopause can benefit from reduced vaginal discomfort and incontinence, while all women can experience greater oxygen circulation in the pelvic region as well as increased stimulation from intimate activity. Creating a tailored pelvic floor strengthening routine is easy. Start by selecting a level of resistance that you find comfortable. As your muscle strength increases over time, you can use a heavier Laselle ball or link more than one exerciser together using the retraction leash to create more resistance and increase the area to squeeze around. It is, however, important to avoid asking too much of your body, and as with any new exercise routine you should always consult your physician with any questions that you may have. • Laselle Kegel Exercisers are made from FDA-approved, phthalate-free silicone and ABS, making them body-safe and comfortable. • The Leash is 7cm long, allowing for easy removal. • The exercisers have a diameter of 36 mm. The packaging of the two products are above and beyond. You can tell that they take pride in the quality, and overall feminine care. Everything is recyclable, which is great, and it all looks super pretty. The kegel exerciser even came with it's own satin white carry bag, to help keep it clean and secure.